Everton have confirmed the capture of Ronald Koeman as their head boss on a three-year deal. 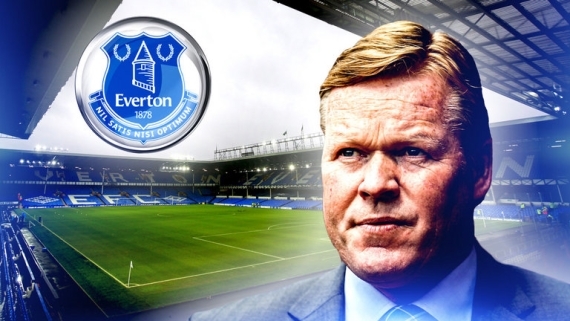 Everton have confirmed the appointment of Ronald Koeman as their new manager on a three-year deal. Koeman, who had one year left on his contract at Southampton, replaces Roberto Martinez who was sacked last month. Everton have paid Saints around £5m compensation for the services of the former Netherlands international defender. The agreement will also see his brother and assistant manager Erwin plus fitness coach Jan Kluitenberg join Koeman at Goodison Park. Martinez, who had three years remaining on his contract, led Everton to the semi-finals of the FA Cup and Capital One Cup this season, but their poor league form - they finished 11th in the Premier League - ultimately proved his undoing and he left after nearly three years at the club. The appointment ends the Dutchman's hugely successful two-year spell on the south coast, where he twice broke Southampton's Premier League points record. They finished sixth last season, taking Saints into the Europa League. Everton chairman Bill Kenwright said: "We are really pleased to have secured the man who was our No 1 target from the moment we set out to appoint a new manager. "Ronald has such a strong track record in the game, instantly commanding respect for what he achieved as a player and for his qualities and accomplishments as a manager. "The hopes and aspirations that we all have as Evertonians are with him, as is our total support at Board, shareholder and fan level." Koeman said: "I am very excited to be Everton manager. I believe in the club, in the team, in the fans and in our ability to achieve things in the future. "Everton is a club with a great history and real ambition and it is a proud feeling for me to be part of what we want to go and do, together with the chairman and Farhad Moshiri. "I am looking forward to meeting everyone at the club and to preparing for a big season in the Premier League." A statement from Saints read: "Southampton Football Club can today confirm it has accepted the resignation of First Team Manager Ronald Koeman, and completed negotiations with Everton over his move to Goodison Park. "The search has already begun for the right appointment who can take the club to the next level and build on our track record of recent success, which culminated in a sixth-place finish in last season's Premier League, as well as qualification for the group stages of the Europa League. "Our focus now is to build on our long-term plan, and work with a new management team who share both the club's and our supporters' values and ambitions. Russia have been handed a suspended disqualification from Euro 2016 by UEFA and fined following violent scenes in Marseille. The Russians will remain in the competition, but have been warned that further serious violence inside stadiums will see them kicked out. 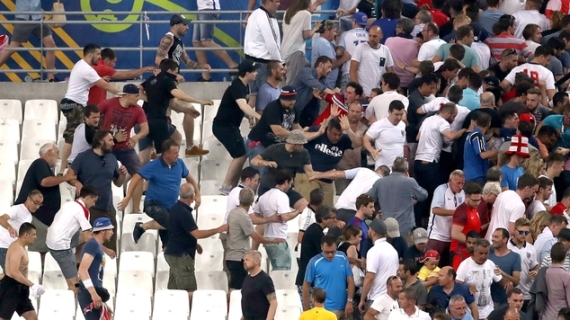 Russian hooligans charged England fans inside the ground after the two teams drew 1-1 last Saturday. There were also three days of violence in the old port area of Marseille, which resulted in dozens of injuries - mostly to Englishmen. "Charges relating to crowd disturbances, use of fireworks and racist behaviour had been brought against the RFU (Russian Football Union)," UEFA, which fined the Russians £118,000, said in a statement. "Such suspension will be lifted if incidents of a similar nature (crowd disturbances) happen inside the stadium at any of the remaining matches of the Russian team during the tournament." The decision only relates to incidents which occurred inside the stadium and are therefore under the jurisdiction of the UEFA disciplinary bodies. The decision is open to appeal but the Russians have confirmed they will not do so. Russia's sports minister Vitaly Mutko told news agency TASS: "A disciplinary decision has been made and we are waiting for an official notification. "We will be following the decision of UEFA and there must be no other stance from the RFU [Russian FA]." If Russia are expelled from Euro 2016 UEFA will set up an emergency panel to discuss how their points will be reallocated. Liverpool have made a £9.5m bid for Udinese midfielder Piotr Zielinski as manager Jurgen Klopp looks to boost his midfield options. The Poland international, who was an unused substitute in last Sunday's 1-0 win over Northern Ireland at Euro 2016, has spent the last two years on loan at Empoli. The 22-year-old is wanted by Napoli but it is believed Anfield is the player's preferred destination and there were claims in the Italian media that Klopp has called Zielinski to outline his plans. "I negotiated for Zielinski with the Pozzo family and we finalised every detail," Napoli president Aurelio de Laurentiis told Corriere dello Sport. "Instead, it now seems as if the player is doing everything possible to resist the move and not come here. He wants Liverpool." Klopp has already signed Schalke centre-back Joel Matip, Red Star Belgrade midfielder Marko Grujic and Mainz goalkeeper Loris Karius for next season as his squad strengthening continues. Michael Carrick has agreed a new one-year deal with Manchester United. The 34-year-old midfielder will extend his relationship with United into an 11th year with the new contract, having arrived at Old Trafford from Tottenham in July 2006. Carrick has gone on to win five Premier League titles, an FA Cup, one League Cup, a FIFA Club World Cup, and a UEFA Champions League in his time as a United player. He told the club's website: "This great club has been a part of my life for the past 10 years, so I am delighted that this incredible journey is continuing. "It's great to have the opportunity to work under Jose Mourinho, who has achieved so much during his managerial career. I would like to thank the fans for their unwavering support. Winning the FA Cup was a special moment and, hopefully, we can go on to win more trophies in the future." Mourinho, who made Villarreal defender Eric Bailly his first signing on Wednesday, is happy to have an experienced head like Carrick as part of his squad. He said: "Michael is a very intelligent midfielder and a great reader of the game. I am pleased that he will be extending his contract. "His form this year shows his ability and his enjoyment of the game are as strong as ever. Michael has a wealth of experience from his many years at the club and that knowledge will be invaluable to me. "I am really looking forward to working with him." Zlatan Ibrahimovic's move to Manchester United is on hold until after Euro 2016 after Sweden's head coach said "it would not be okay" for him to fly to England and complete the deal. "Players have their leisure time on the schedule, what they do then there's nothing I can do to control. But it would not be okay for Zlatan to fly to Manchester," Sweden coach Erik Hamren told a press conference at Sweden's base in Nantes. "I'm one hundred percent sure (the furore) it will not affect Zlatan. He has been in the business a long time. He handles it perfectly. "The players of the national team are accustomed to all the rumours surrounding Zlatan too. They are familiar with it. There is absolutely nothing that has affected us negatively in the group. "I am for sure the rumours surrounding the captain will not affect the team. I understand there is a lot of Zlatan media, not only in Sweden. But, with us, it is nothing." 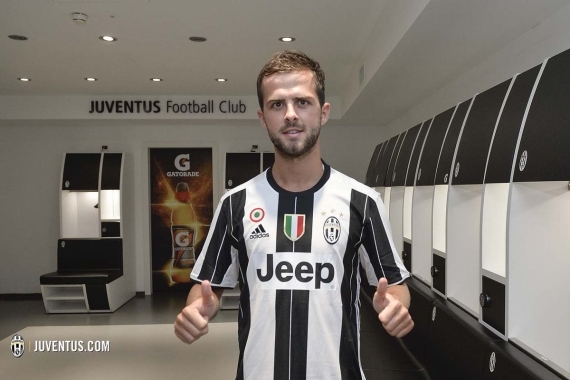 Juventus have completed the signing of Miralem Pjanic from Roma. The 26-year-old midfielder, who had been linked with a switch to Chelsea this summer, has signed a five-year deal in Turin worth £3.5m a year. The Bosnia international was under contract with Roma until June 2018 but had an agreement which allowed him to leave provided a 38m Euros release clause was activated. He began his career in France with Metz, before enjoying a three-year spell at Lyon. In 2011, he made the move to Serie A with Roma, and made 159 appearances, scoring 27 goals, including 10 last season. He also contributed 12 assists in 33 league appearances as Roma secured a third-place finish. In the mould of former Juventus schemer Andrea Pirlo, Pjanic thrived in the Italian capital as a deep-lying playmaker. Liverpool have officially confirmed the departure of defender Kolo Toure after publishing the list of the club's retained players. The 35-year-old Ivory Coast international is the highest-profile name to leave Anfield this summer after his contract expired. The Reds chose not to offer Toure a new deal despite him finishing the season as first-choice centre-back alongside Dejan Lovren and impressing in Liverpool's Europa League final defeat to Sevilla. There was a point in the last month when there appeared to be a chance Toure could be given a new short-term contract with the future of Mamadou Sakho unclear after his failed drugs test. However, the France international's initial 30-day suspension has not been extended as UEFA investigates whether or not the fat burning substance found in his sample should even be on its banned list. With that in mind, and the fact Joel Matip is arriving from Schalke on a free transfer and the 19-year-old Joe Gomez is returning to fitness after a cruciate knee ligament operation, the decision has been made to let Toure go. Liverpool had considered offering Toure a coaching role but the defender is keen to extend his playing career as long as possible and could now get a lucrative deal as a free agent. Former Liverpool and Norway defender John Arne Riise has officially hung up his boots, calling time on his career. The 35-year-old, who was part of Liverpool’s 2005 Champions League-winning team, had made 10 appearances for Norwegian club Aalesund this season, but has ended his stay short after admitting he cannot cope with the physical demands of the game. "My inner goal was to play football at the Norwegian top level until I was 40. But that is not to be. It stops here," he wrote on his personal website. "Lately there has emerged a completely new feeling in me that I am no longer strong enough to perform at my best. "I like to play football but the motivation is still not strong enough to run the race at the highest level. This body - and this head - has been through so much over the last 20 years. "It is heavy and painful admission and very full of emotion but it is most of all honest." Riise played for a range of clubs across Europe in his career, including Monaco, Roma, Fulham, APOEL and Delhi Dynamos, while earning 110 caps for his country. Last season's PFA Player of the of the Year Riyad Mahrez says he has not yet decided whether his future will be with Leicester City. Mahrez was one of the key players in the Foxes' surprise Premier League winning season last term, scoring 17 goals and providing 11 assists in 37 League appearances. His performances have caught the eye of several big clubs, such as Arsenal, who are also believed to be interested in the Algerian's Leicester teammate, Jamie Vardy. The 25-year-old has repeatedly stated his desire to one day play for Real Madrid, but it is uncertain whether he would consider quitting the Foxes for Arsenal, and the player himself was reluctant to shed any light on the topic. "It is flattering to hear, as I said nothing is agreed, nothing is done," he told Get French Football. "We will see. For the moment I have not made a decision. We will see. It is possible that I stay, it is possible that I leave. We will see." Mahrez did admit that he was happy at Leicester and was proud of the season the club had, perhaps giving Foxes fans a glimmer of hope he may stick around for a while. "The season went very well. As you know, we have won the league which was very important. It is incredible," he added. "It was by far my best season in my career. I am not putting pressure on myself. It will be a season about confirming. "Without pressure, I will have to work hard. Leicester is a family club. I would like to stay. I am very happy." Manchester City will be forced into breaking the British transfer record if they are to bring Borussia Dortmund's Pierre-Emerick Aubameyang to the Etihad this summer. A salivating prospect involving the Gabonese joining Kevin De Bruyne and Sergio Aguero up top for City could materialise, but they will need to stump up a mind-blowing £65 million to push through a deal. After scoring 25 goals during the campaign, Aubameyang was named Bundesliga player of the season and appears to be a key part of Pep Guardiola's plans as a new era kicks off in Manchester. Senegalese defender Kalidou Koulibaly says he expects to start discussions with Chelsea soon and claims there is no commitment from Napoli to renew his contract. The versatile defender has also been linked with Arsenal, Manchester United, Real Madrid and Bayern Munich in recent weeks. However, the player himself has not alluded a specific club as a particular destination before now. "Big clubs want to sign me and there is no sign of a renewal with Napoli," Koulibaly told The Sun. "The negotiations for a contract extension have stalled and they never wanted to discuss with us. "I have not talked to [Antonio Conte] but that may be soon. If nothing happens at Napoli, I will start to have contact with other clubs. "The game In England could be suitable for me but I like Italy, I do not press for a transfer but I hope to sign a renewal with Napoli or we proceed to other solutions. Napoli also wants to make money. The Senegal international has spent two seasons in Naples, making 59 Serie A appearances after moving there from Belgian club Genk. Out-of-favour Barcelona midfielder Alex Song is reportedly on the verge of sealing a move to Turkish outfit Galatasaray. According to reports that have emerged from fotospor, the Cameroon international is said to have reached an agreement with Galatasaray, but will have to wait for consent to be given by the Nou Camp outfit, as he is under contract until 2017. The 27-year-old, who has spent the last two seasons on loan with English Premier League outfit West Ham United, provided one assist in 15 appearances for the Hammers last season and also spent some time playing for the U21 side. Song's agent, Darren Dein, and Galatasaray's sporting director Cenk Ergun have reportedly agreed on a three-year deal worth 1.5 million euro per season. Galatasaray finished the 2015/16 campaign in 6th position and will be looking to revamp their squad ahead of next season. Athletic Bilbao have announced defender Aymeric Laporte has extended his contract with the club through to the summer of 2020. The 22-year-old Frenchman had been strongly linked with Manchester City during the summer but a statement from Bilbao on Monday evening said Laporte had committed his future to the La Liga club for the next four years. It added the release clause would be £52m for 2016-17 and 2017-18, with that then growing to £56m for the two seasons after.